The picture that everyone has long been waiting to see became available after 3:25 pm (Eastern) this afternoon, when BP closed the choke lines on the 3-ram stack, and oil stopped flowing into the Gulf. The process started on Wednesday evening , after a delay during which the Admiral gave permission for the process to start, and held the press conference that I reported on yesterday. It was followed by the Kent Wells conference, which had been delayed, in which he noted that the relief well had finished a gyro survey to locate its position, and prepared the site for the casing to be set this weekend. Then the drill pipe etc was pulled back into the casing while the integrity test was run. It was left in the well so that, in case there was any passage created between the two wells during the test (they are only just over four feet apart) then heavy mud could be immediately pumped down the RW to kill the risk of any additional problems. (The drill has 30 ft to go to reach the casing point, but is at the desired 2 degree angle). One of the changes to the plan from that originally conceived was to add four ROVs that would be stationed around the well to alleviate the fears of those who had become worried by the continuing plethora of stories of a breached well casing. 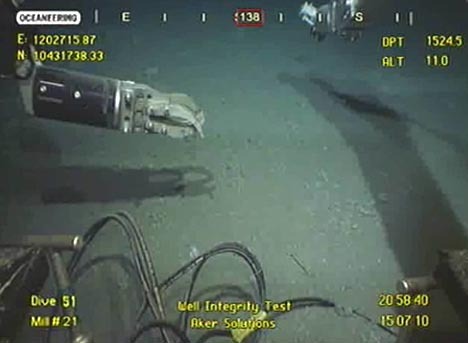 Although many of these stories have been discussed, and their invalidity shown, nevertheless in order to keep everyone happy, particularly those with political prominence) four ROVs were set around the well to watch the seabed and ensure there were no leaks. Had there been any leakage from the well it would likely have come up around the casing of the well at the bottom. Here is the shot (BOA ROV 1) of the mud-line of the well. (The point where the well breaks through the mud to the sea bed). The other change that Secretary Chu apparently imposed was that there be a conference every six hours during the test (which is scheduled to run 48 hours). The initial plan was to close the rams sealing the well (which happened before I wrote the post yesterday) and then to close the kill line (the two ports that produced the vertical jets I showed last evening) and then to slowly (over a few minutes) close the choke, monitoring the pressure, until the flow ceased. There should also be a little clarity in the discussion at this point. There are two sets of valves and circuits involved in this process. The first of these are the circuits on the original blowout preventer (BOP) . The kill and choke lines attached to those circuits were modified so that oil and gas are fed through them to the vessels on the surface which are either collecting or burning off the fuel. The second set of kill and choke valves are on the new stack that was mounted above the BOP, and it is these new valves that are being opened and closed. When the stack valves are open the oil flows out into the water, rather than into directed lines, and so they are not the same circuits. 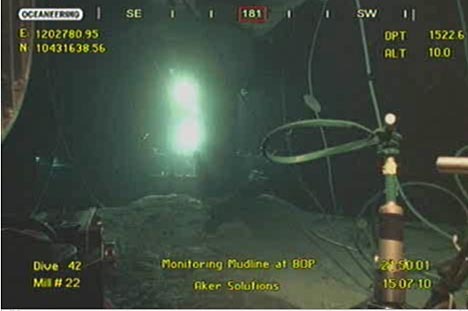 At the beginning of the test the BOP valves were closed, so that all the flow went up to the stack where it can flow out through either the drill pipe at the top, the kill lines to the side, or the choke line – which is the curved yellow pipe at the top of the well. 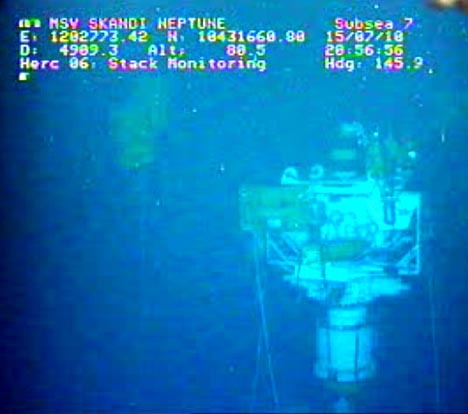 The drill pipe flow was first closed, using the central ram in the stack. As the test began (and as Kent Wells noted in the morning briefing today) there was a leak. we noticed a leak on a hub on the choke line. And so when we saw that, that would have precluded us from properly doing the test we needed to get that fixed. Fortunately, as everything, we always plan so we had a second choke on surface. So we disconnected that choke and hub system. Took it up, brought the other one down, landed it this morning and we’re once again going through the process of positioning ourselves to do the well integrity tests. There were in fact two trips to the surface before the choke line was fully in place. At 10:30 this morning we closed the kill line and since we had already had the middle ram of the capping stack closed that meant the only flow at that point was going out through the choke line and what was also being collected through the Q4000 and the helix producer. Then between 10:30 and 12:30 we shut down the Q4000, we shut down the helix producer and that meant only flow was going up through the choke line and then at 12:30 we started to close the choke, we would do it a half a turn at a time to just slowly start to close the well in. And at about 1:15 this afternoon we issued that the integrity test was starting. The official time of the choke being fully closed, which meant the well was fully shut in is approximately 2:25 this afternoon and as of that time there is no flow of oil going into the gulf of Mexico. So obviously this is an encouraging point of time. Remember this is the start of our test. "We're encouraged by this development, but this isn't over. Over the next several hours we will continue to collect data and work with the federal science team to analyze this information and perform additional seismic mapping runs in the hopes of gaining a better understanding on the condition of the well bore and options for temporary shut in of the well during a hurricane. It remains likely that we will return to the containment process using this new stacking cap connected to the risers to attempt to collect up to 80,000 barrels of oil per day until the relief well is completed." Part of the problem, apparently, is that the well pressure has not reached the 8 - 9,000 psi level that it was hoped it would reach, but instead it is reported to have fallen slightly shy of 7,000 psi. While this is below the expectation, it is higher than the 6,000 psi that Admiral Allen had set as the target below which they would assume a loss in integrity, and restart the flow of oil to the surface vessels. To try and add a little context to this, at the beginning of the leak the pressure of the oil and gas in the rock at the bottom of the well was measured at 11,900 psi. When the oil and gas fill the well that fluid column has a certain weight that balances some of the rock pressure, and the difference should be the pressure at the top of the column (which is where the BOP and stack sit). That gives the 8 – 9,000 psi range. If the well pressure at the BOP is measured, however, at just shy of 7,000 psi then there are two possibilities. The first is that there has been so much flow of fluid out of the well that the driving pressure of the fluid in the rock has fallen by the 1,500 psi or so that brings the pressures down to those seen. While that is a possibility, it may be unlikely because, at the time that the Top Kill was tried and as the Admiral noted just the other day, the well pressure could not be raised above 6,000 psi as they pumped in mud, even though at one stage they stopped the flow of oil out of the well. Exactly. I believe the flow will be coming out of the bottom sand and going into the upper sand. It would not be a leak, but it would tell them why their pressure data ain't a classical surface buildup. And I sure hope they're modeling temperatures and so on, because this is a very interesting case. They don't have downhole gauges, so they'll have to take the way the oil cools down as it sits to get a better idea of the way things are moving down below. If there are questions whether there is still flow in the formation or from the original formation into surrounding rock, then it is possible that the RW is close enough to the WW that putting a set of very sensitive microphones down the RW might allow some triangulation to estimate where such a flow might be occurring. It might make it easier that the well hasn’t been finally cased yet. But the test has 2 days to run, and will be evaluated every 6 hours. With time some of these questions may be answered as the test continues. (If there is no flow anywhere, after a while all the readings should become quite stable). The windows of opportunity are not likely to remain open long. 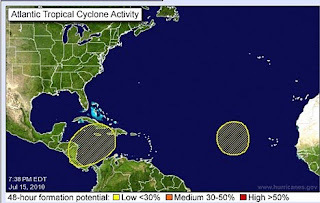 It is encouraging, however, that there may now be an answer if these do turn into hurricanes. "The other change that Secretary Chu apparently imposed was that there be a conference every six hours during the test"
Your tax dollars at work. Nobel Prize winners sitting around yaking, while real men do the work. Thanks, Obama! I yield to no-one in my contempt for the foolish cost-cutting arrogance of BP's management which caused this disaster. But I am deeply impressed with what the real men lower down BP's organization have been able to do -- getting equipment custom-manufactured and installed in a matter of weeks. Now if only Chu, Obama and the rest of that hapless Administration were doing at least a barely competent job of sweeping up the leaked oil while it is still at sea!